We all want to be successful in life, right? Be it in our career or family life or even other aspects, we all have some ambitions and we want to achieve them. It gives us the reason to live. Being a human all of us are blessed with brains, and thus it is also our responsibility to use it for a better (if not the best) purpose. By nature, we all grew up in a way that we can easily understand the things by example. Possibly, this is the reason why we love to know more about the legends and analyze the way he/she dealt with the things and eventually became successful. It is said that when you learn the things by experience, it will remain with you forever. There is a saying reflecting the same thought, “experience is the best teacher“. Human life is so short, and we cannot afford to experience everything. The solution thus is to learn from others’ experiences and use them as a guideline. Of course, we need to apply our own mind and reasoning when implementing that proven stuff. We at ThinkerViews, often talk about inspirational and motivational stuff including TV Serials, Commencement Speeches, Magazines, and Books. 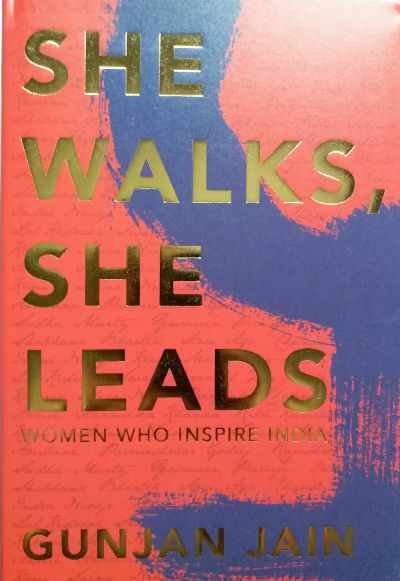 Recently I came across a book named She Walks, She Leads with the tagline “Women Who Inspires India“. So we’ve decided to read it and review it for all our readers, if we find it worth sharing. Fortunately, from our team, I got the chance to read this book. Let us take a look at the cover of the book. It is easy to imagine the cover of this book, containing thumbnails of many remarkable women and some motivational quotes or metaphors. The cover, however, is quite simple yet elegant combination of some of the very basic colors. The finishing of the cover page is really of high quality. The book talks about 24 successful women or rather say females who lead in various areas and prove their metal. We can categorize their area of working in mainly six segments. Late Parmeshwar Godrej: Director, Godrej Properties Ltd.
Kiran Mazumdar Shaw: Chairman & MD, Biocon Ltd.
Let us look at the tales of each of them, one by one. Nita Ambani is a well know person. In addition to her identity as a wife of a wealthy businessman, she herself does some good works which make a mark. Her story is explored in 30 pages in this book and it ends with an interview with Mr. Mukesh Ambani talking about her. While being in limelight, a lot has been talked about her, but the author tries to show substance from her story. In the book, a lot is written about her middle-class upbringing and how it implanted family values in her. We can see a strong family bond and the family values implanted in her children also. She is a woman with a very strong will and that is something she represented at various stages of her life. She even continued working as a teacher after getting married in a really wealthy family where she could have lead a lavish life without doing anything. For me, power means the change, to empower people. Rajashree Birla‘s tale is explored in 16 pages and it concludes with an inspirational message. Her life was full of ups and downs. Late G. D. Birla was associated with freedom movement and even Gandhiji used to stay at the Birla house those days (when in the city) and the will to do something for the society was flowing in the veins of the generations of the family. Rajashree was married at the age of just 10 years. She lived in a conservative and happy family. Her days and nights spent along with the family. So when she was shifted to Mumbai, out of the protective zone of the family, she found it quite uneasy yet challenging. She started exploring her wings and with the untimely demise of her husband Aditya, she holds the family and business at very young age. Also, the way she managed her relations (which are since 125 years!) with the Bajaj family when there is a time of dispute is really commendable. Then comes the tale of Sudha Murty, a simple, intelligent and humble lady. Sudha is quite vocal and very confident lady since very young age. As mentioned in her 18 pages long mini-biography in this book, she was the only girl in her class of engineering. And eventually, after completing her studies, she came to know about vacancies at TELCO. The advertisement contained the message that “Lady candidates need not apply“. It made her so furious that she wrote a letter to Mr. JRD Tata lecturing about gender equality and all! Imagine her courage in doing that! Girls were choosing comparatively soft jobs, especially those days. She was chosen in TELCO as Mr. Tata considered the potential in her, and she was allowed the duty in the research wing. She was again felt being sidelined and asked for the duty in the field! She remained backbone and rock-solid support to MR. Narayan Murty during his struggle days and even funded his company! Of course, it became a software giant later on, but the base was enforced by her. Then comes the tale of Yasmeen Premji, who many people can remember as a wife of a well-known businessman. But, she is the one who made her own identity by her own efforts. A very few know that she wrote a book named Days of Gold and Sepia. Now it could have been very easy for her to get a publisher and even making a grand book release event right? Yes, indeed. She, however, decided to remain humble and even not declaring her identity to get the book published. A 15-page mini-biography of Yasmeen brings many such incidents to reader’s attention and concludes with an interesting interview with Mr. Azim Premji. Sometimes, when our lives change, we get caught up in trying to live up to others’ expectations of us, occasionally even remoulding ourselves to fit into their image of us. Parmeswar Godrej was in the limelight as she was associated with Gladrags magazine and other stuff. She was busy being social and doing other activities in addition to looking after the family pages. Her mini-biography speed in across 28 pages where you can find her husband Adi Godrej talking about her. Her father was in the military so she was grown up in a very disciplined environment. The grew up was responsible for letting her understand the importance of self-esteem and she had a respect for the integrity. Maybe the disciplined environment is something which we don’t like as a kid, but we understand its importance later in real life. It gave me tremendous emotional satisfaction to be able to bring about positive change in the lives of others. As Adi says in the interview, if you possess such qualities, then just be your own person, and don’t think too much about what expectations others are having from you. Indra Nooyi achieved international fame as the CEO of Pepsico. Pepsico is the second biggest company of the world (Nestle is the first), and the responsibility of the CEO of such a large company is not an easy job. If you’ve heard any other conversation from Indra, you could’ve found that she is a very humble and grounded lady and a major role in the same is played by her mother. In this mini-biography which is spread over 23 pages, her upbringing is discussed. When she was young, her mother used to ask her and her sister, what will you do to change the world? Don’t you think that parenting is an art? It is good to know that she and her sister still keeps in touch with her mother to get guidance. If you want to make a mark, you need to be a constant learner/lifelong student. She teaches a very important lesson about goals, which is often reflected in some of the speeches of Mr. Narendra Modi, the Prime Minister of India. It is something like: Don’t plan your career to become a CEO of so an so company, just do your work in the best way you can, and you will achieve the success. The designation or target should be a byproduct result of your efforts. People, too often are focused on the destination and not the task that will take you to that destination. It is glass because we can see through it and it can be broken. Her tale concludes with an interesting interview with Mr. Ajay Banga, the MasterCard CEO. One more thing to learn from her is to acknowledge the contribution of those who stood behind you as a rock-solid support. She says I admire my husband, (as) he is often overshadowed (as people talk more about Indra an her achievements and she is in the limelight most of the times). Name of Chanda Kochar is among the list of remarkable CEOs who made a mark. ICICI is one of the topmost private sector banks in India and Chanda serves as the MD & CEO of the same since a remarkable period and she has proved her abilities. In this book, some interesting stuff about her personal and professional life is explored via an article of 16 pages which concludes with the interview with Mr. K. V. Kamath who is like a mentor to her. A very few people know that her father passed away at an early age. It is her mother who took care of the family and her fashion design business. Though she had a middle-class upbringing, her father was a strong person who believed in equal opportunities to all without any gender bias. Obviously, things were different when he was no more. She understood that for her the study comes first. If there is a challenge, your shoulders out to become broader and your back straighter. Does it sound like something you hear from a top rank army official right? Well, it must have given you an idea of what makes her someone to sought after. She is very focused on the work and she has a very clear thinking, as her mentor suggests. Arnavaz ‘Ani’ Aga aka Anu is a Philanthropist and she has served as a parliamentarian as well. She considers her years as the parliamentarian as the best of her. The reason is obvious, it gave her the opportunity to actually make a difference in many people’s lives, at various extent. She also genuinely believes in equal rights for every human being irrespective of caste, religion or geography. Her tale is explored in 14 pages, which is concluded with an interesting small interview with Ashok Shekhar Ganguly who had seen her working for the greater good. Her inner strength is her most reliable asset. Death is a dismal business; and grief, an intensely personal one. Keeping the personal and professional lives separate is a tough task, almost impossible at a certain level. But if you have a bigger goal, if you want to make the society a better place then you have to do the focused work. As mentioned in the book, her other remarkable qualities are honesty, uprightness, frankness and being visionary. It is very important for everyone to have a purpose in life beyond just getting married or having children. Naina Lal Kidwai, better known as the former chairperson of HSBC India is known more in financial circle. In a tale spread over 18 pages and concluded by an interview with Deepak Parekh we got to know a lot about her. She remembers lessons from her teacher about the importance of integrity and serving those who are less fortunate. Her years in foreign (where she went for further studies) made her self-dependent. You may find it quite amusing but, she learned new the things learn new things like how to use ATM or shop at the supermarket there. Yes, for the majority of us, it is a kind of routine tasks these days, but things were not that simple for her. She survived there because of her never say die attitude. She is coming from a middle-class family and you can see in the article that she is still grounded and humble. And that is how one should. We admire her for that. When asked about how the things are to be mainly between the couple (especially when both are working), she has a simple and small answer. Kiran Mazumdar-Shaw name appears many times in TV shows where celebrities are doing chit-chat or in English newspapers. Many people are not aware of her actual job functions and what made her a successful person. In a 19 pages mini-biography about her which concludes with an interview with Devi Shetty, the author tries to show us some of the remarkable qualities one can pursue by knowing about her. Rather than, talking much about it, I will share some of the interesting points I found in it and rest you can explore by reading the book. Life can be difficult, but if it were not, it would be boring. Taking challenges gives you confidence. Leadership comes from within and has to do with vision. When you pick yourself up after you fail, it makes you stronger. She grew up in India and went for further studies in Australia. When she came back from there and looking for a job, she found that no one willing to take a woman in the brewing industry. So she had to swim against the tide here (remember, how Sudha Murty had to do the same for her job in TELCO?). In a very similar way to Indra Nooyi, she also talks about limits as glass ceilings and how one can break it. You may not find Zia Mody’s name ringing bells if you are not much into legal things and explored the arena of elite lawyers. Telling that she is the daughter of Soli Sorabji may give you some idea. There is a small and interesting article about her which concludes with an interview with Jaydev Mody where we know more about her. Though she is a daughter of one of the most well-known lawyers of the country, she built her career solely by dint of her own hard work. You will find it amusing to read about how one day her father passing by a court heard heated arguments where a lady lawyer was putting her point quite logically. Curiosity made him go inside and he found that it was his daughter Zia! One had to work hard to establish oneself. Swati Piramal holds a top position in Piramal group but she is more into spirituality! In a 21 pages article about her which concludes with an interview with Ajay Piramal we got to know a lot about her. It is something interesting to know that since very young age, helping others, is her motto. As mentioned in the book she wanted to become a doctor to help people who need attention. One needs both the hard-as nail business side as well as the heart. Film stars are treated as celebrities and they get a lot of attention in media, so almost tiny details about them are also known to the majority of the readers. so in this segment, we will not talk much about them individually and will give you only a brief insight. The article about Priyanka Chopra is spread in over 16 pages and concludes with the interview of fellow actor Ranveer Singh. A lot has been told about her journey from a small town to being awarded as the most beautiful woman around the world. Her journey could not have been accomplished with her biggest asset, her self-confidence. When she was asked about her qualities, she mentions that according to her they are “Courage and Conviction”, and we agree to the same. The world is your oyster so don’t restricted in a bubble. Mira Nair is an accomplished film maker and there are many non-traditional (in terms of Mainstream Bollywood Movies) movies fall in her account. Her life is explored in a 15 pages wide story which concludes with an interview with Ronnie Screwvala. She herself is an avid reader, and you can find it from her movies also. Shabana Azmi is among those few actors who hold the celebrity status and are actually respected for their social work as well. Do you remember an indirect reference to her made in a Madhur Bhandarkar movie? I grew up in a family which believed that art is an instrument for social change. You may consider Kareena Kapoor Khan a social change maker or not, her commercial success is something no one can deny. In a 17 pages long article which concludes with an interview with Karan Johar, you got to know about many things. Most of the stuff is known to the people as she had a good PR team. She values relations and once committed she loves to remain that way. Her philosophy (which is evident from her life) is, “Live your own life“. Anamika Khanna is a famous fashion designer. Since the 90s the world of fashion designer became more known to the people and often is considered as the entry gate to the film industry. Anamika made her mark with her qualities like being humble, disciplined and caring. She is a very confident person who values independence. Blessed to be in a position to be able to use resources and making the slightest difference. Arguably on of the most notable female fahion designer across India is Ritu Kumar. In a 15 pages long article about her which concludes with an intersting interview with Rajiv Sethi we got to know her uniqueness. You may not believe it but she seems to be a tradition lover. She loves to make the fusion of traditional stuff with the modern aspects. It gives us a message that you can be modern without losing your values. This is the biggest lesson I learn from her story. Her fashion philosophy is similar to all other intellectual fashionistas. What you are comfortable in should be in fashion. You can be fashionable without being a victim. Shobhana Bhartia is the chairperson of HT Media and you can assume the hectic work life she leads. In a 22 page article which concludes with an interview with Sanjiv Goenka, we got to know more about her. Two key points to take away from her life are respecting and taking forward the family values and setting up the right priorities. Changing mindset or work routine is very difficult; getting people to give up bad old habits and pick up good new habits is equally difficult. So someone who wants to lead successfully needs to work on keeping the stuff and staff updated with the latest technologies and keep updating the work routine. Indu Jain serves on the top position in the business. Her life, however, is a spiritual extension! A 16 pages long article is different than the others in a way that it ends with an interview with Jain family (instead of a single family member). In addition, to put the focus on confidence and faith, her story talks about the importance of having a balanced life. Bringing balance, synergy and respect for one another’s performance. M C Mary Kom’s name is not unknown to almost anyone who is interested in sports. A fantastic biography of hers is published with the title Unbreakable which was later on adapted in a movie named Mary Kom which was not that good but was a commercial success. In a 13 page semi-biographical article about her we get some glimpses of her life. It concludes with an interview with Priyanka Chopra who played Mary Kom in the biographical film. So, as you are mentored by someone, you need to mentor someone too. This is how the chain of education (in real meaning) will go on. Sania Mirza – the name requires no introduction right? In a 15 pages article about her we got to know her more. The article concludes with an interview with Mahesh Bhupathi, an ACE tennis player. I have always been true to myself and my family and I don’t ever want to be any other way. The last life story from this book belongs to Saina Nehwal. She is a tough girl and she is a fighter all the way. Her unrelenting patience makes her what she is. And yes, lifelong learning is required to remain competitive. While I’ve discussed what to get from each of these significant woman’s life story and some of the interesting lines and messages from each article, you must have got the idea for the book. The book is really lengthy and I consider it as both positive and negative aspect of the same. While it gives a chance to hold many inspirational tales together, it also becomes bulky and pricey too. It could have been better if the book was available in parts. Maybe for kindle edition at least, the author may think to make all 24 tales available individually. This will let the readers go for their interest at the cheaper rate, but, well, this is my thought. Collecting information which is not available in public domain and something personal and inspiration, that too for 24 women who are almost enjoying the celebrity status and have busy schedules, is not a small task. The book has views about these celebrities from more than 100 people, so the author must have met them all. Arranging meetings, making them feel comfortable to be open about their lives, is definitely time and effort consuming task. Gunjan must be appreciated for the efforts. Just as after (reading) a good book one feels like the author is an old friend, listening to Sudha narrate her life makes me fight the urge to give her a hug (page 56). The detailed glossary is another positive attribute of the book. There are some rare photographs of almost each of these 24 women are included in 3 segments. They all are printed on glossy papers and they add the value to the book. What I found common in the majority of life-stories is the person is grown up in a middle-class background and/or grown up with a positive environment which implanted good qualities, and it leads her to become a better human. Also, these days, feminism is grown into the wrong idea. Rather than talking about gender equality it often leads to male-bashing, which is wrong by all means. Judging the feminism quotient using the cloth length is also a wrong perspective. “If you drink, smoke and do adultery then you are modern”, this is wrong, it is quite contrary actually. What I find in this book is the real idea of women-empowerment and gender equality. The way the females came out of comfort zone and leads, without letting their gender come as a hurdle or even the stepping stones, is really appreciable. The support given by the family members, friends, and others is acknowledged by each of them. The author deserves appreciation for writing the book from the right perspective. Well, some of the readers may want to see some other women being added to the list and some may like some of the tales to be removed. It is, however, a personal perspective. The author reserves the right to choose the list and the reader should respect it. With the same thought, I appreciate if more women from armed forces and other areas have considered it could have been a much better book. But then, the length of the book could have been even more. So rather let us expect a few more books in the series:). In addition to being a costly and too big book, here are some of the other let downs. The printing is done in very small fonts. At places, they are quite tiny and you feel it. Having such a good quality book, the readability quotients must have been taken care of. Ideally, distributing the book into multiple parts could solve these issues. Also, there requires a short bio of each of the woman along with her photo at the beginning of the respective article. This will make the reader connect to the content quite easily. This review article is quite large, but I don’t skip at least a few things from each of the stories. Also, this time we’ve tried a little different layout for our review article. It has a kind of index in the beginning which leads to each story directly, similar to WikiPedia article user interface. Do let me know your thoughts about the same, and whether we should continue it? A nice collection of mini-biographies of 24 inspirational women with the Indian connection. It is a large book and is pricey too. Not easy to carry while traveling. Though you can read it in chunks, and based on your mood you can pick any of the tales randomly, that will let you make sure of the best use of the short time you get. If you are looking for something positive to read, it is recommended.